Yikes the weekend is over already and I was just getting started!!! Today I have a CottageCutz card created with the wonderful dies from The Scrapping Cottage. By the way, did you see the new releases-Halloween, Winter Wonderland, and Christmas Cheer. Oh my goodness I am super excited about all of them. They coordinate with last years releases perfectly! 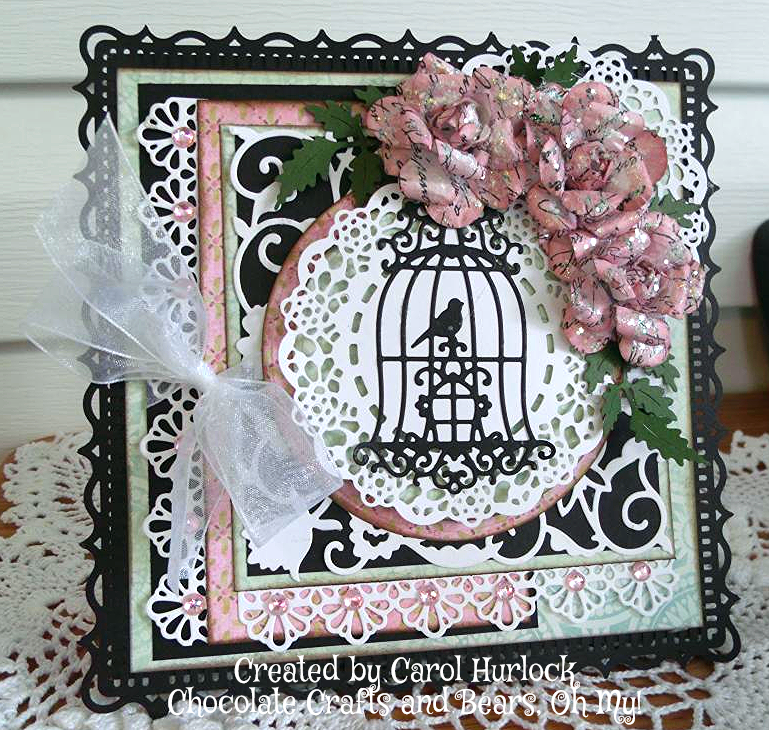 For this card I used 5 CottageCutz dies. Fancy Floral Lace Border, Fancy Floral Background, Fancy Ornate Birdcage, Greenery, and Tea Time Doily. Here's a tip. 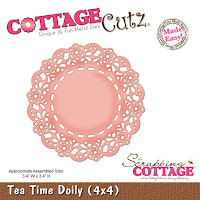 My Tea Time Doily was used so much that it wasn't cutting properly. I replaced the foam cover and now it is cutting like it was brand spanking new. Replace those foam pads if you find your die doesn't cut like it used to! 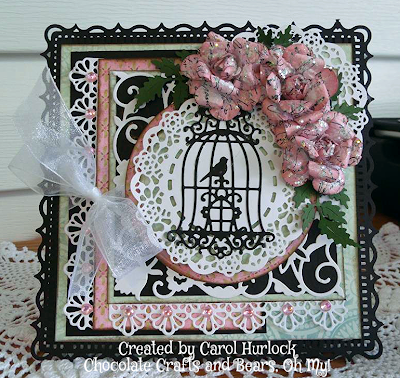 The Fancy Ornate Birdcage was mounted on the Tea Time Doily and a Team Time Doily was used as an embellishment behind these punched flowers. 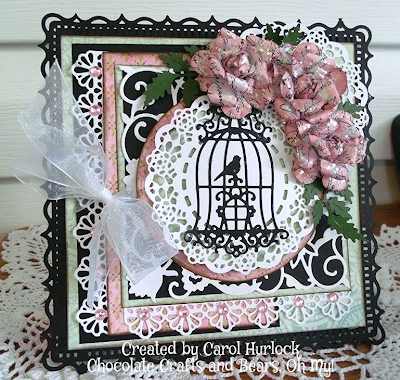 The border around the outside of the card is a Martha Stewart Punch Around the Page set. 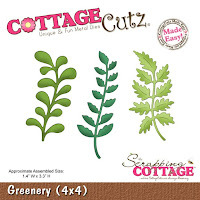 The flowers were created with a regular 5 rounded petal punch. They were stamped with an old Stampin Up text stamp I picked up at a yard sale some time back. 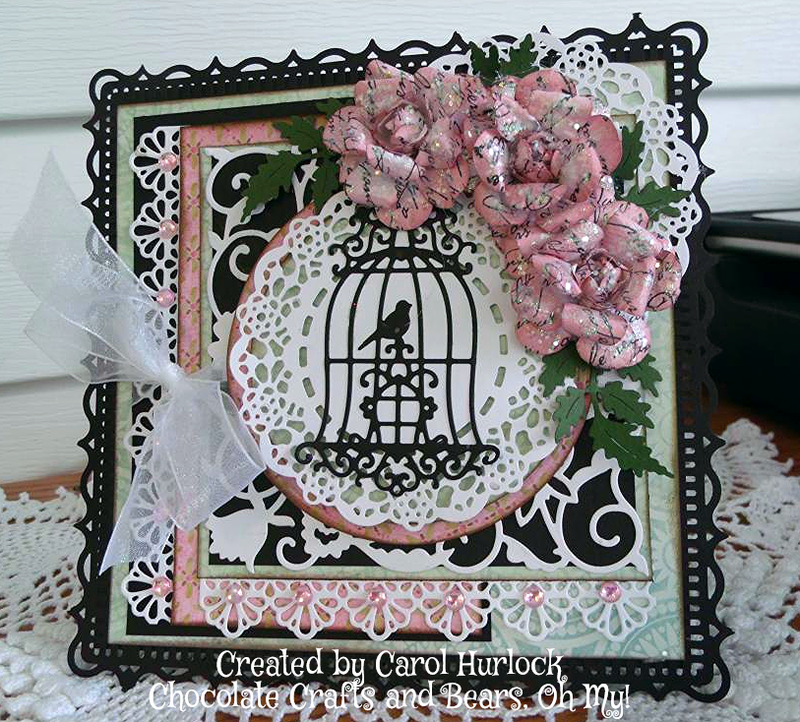 Then Victorian Velvet Rangers Ink was sponged on the petals. Eye popping, jaw dropping, breathtaking GORGEOUS!!!!! Love every thing about it! The flowers are amazing! Good tip with the foam pad. Thanks for sharing that info. Your card is a beautiful creation. Love every die you used and the flowers are wonderful. This is just scrumptious! That doily just does amazing things doesn't it? And the touch of black just pops it all up so beautifully. Gorgeous! So many lacey and pretty details. 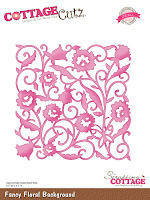 Gorgeous colors, pretty flowers, great die cuts, amazing work my friend. I love it but then I love everything you make. I can't wait to watch you work! Hugz - 42,000 of them (like the details on this card). 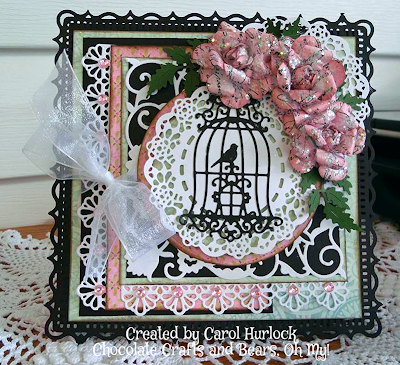 Love all of the gorgeous dies together- and the flowers- fabulous!!! So pretty! 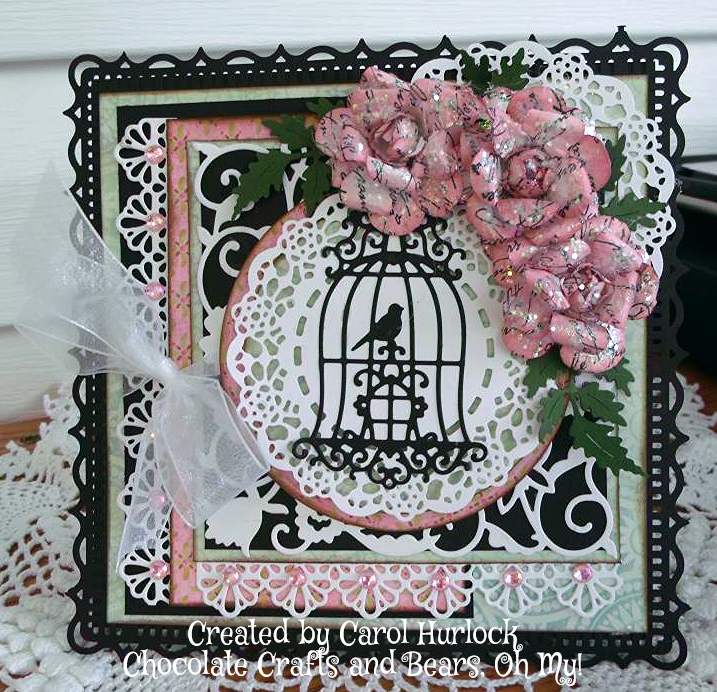 And this uses my favorite color combo! This is absolutely gorgeous. I love the flowers.